I made a useful discovery when I picked up my first Janie Lynn Panagopoulos book. She is a Michigan native, and her novels bring our state’s past to life for children. 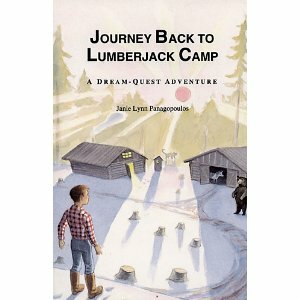 I have now read three of her books: Traders in Time, Journey Back to Lumberjack Camp, and Mark of the Bear Claw, and I would give my recommendation to others considering her work. Ms. Panagopoulos writes at what I would estimate to be about a fourth grade level, making her stories easily digestible for independent fourth- and fifth-grade readers and an excellent read-aloud choice for third-graders. They are thoroughly-researched, informative, humorous and imaginative, and my kids loved them. By pl acing readers in an exciting adventure set in distant times, they do a fantastic job opening kids’ eyes to what life may have been like. I do have a few criticisms, however. First, each of the books I read contain many typos, which must be credited to River Road Publishing’s editorial department rather than the author. It’s a minor flaw, but one that gives the book a sloppy, unprofessional feeling. 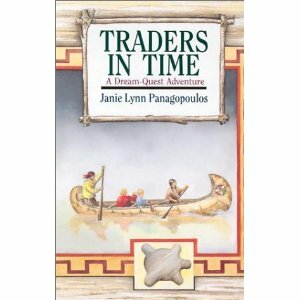 Second, two of the books are from Ms. Panagopoulos’ “Dream-Quest” series, and they both sent their main characters back in time with a bump on the head. I’m not a fan of time travel anyway, but especially not by such unimaginative means. And finally, Ms. Panagopoulos’ writing just doesn’t rank among the work of today’s premier children’s authors. Interesting historical facts or details are often recited verbatim through a teacher’s lecture or an observer’s thoughts rather than woven into the story. Her dialogue is often choppy and awkward. And her prose simply lacks beauty. I began each of Ms. Panagopoulos’ books hesitantly, unimpressed. But each time, I pressed on and became caught up in the excitement of her story and the interesting time period she revealed. She will never rank among my favorite authors, yet at the third-fifth grade level, her stories are overwhelmingly beneficial.